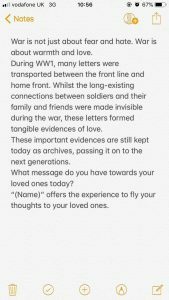 The revised idea was to explore how we could bring to light more positive aspects of the war; being in the centenary this year we wanted to remember in a different way. Our goal was to create an experience that provoked thought, but also an emotional response. 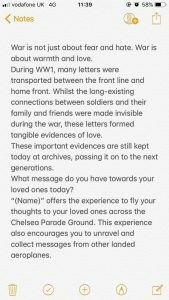 A way we thought about doing this was through inviting people to write letters or messages which they could transform into paper airplanes and show across the Chelsea Parade Ground. 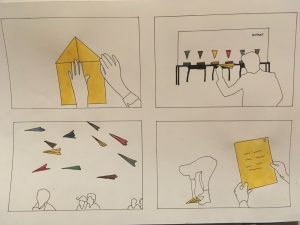 We also encouraged people to unravel other paper planes that landed on the Parade Ground. We created several version of statement.